This image released by the United States Postal Service shows a postage stamp featuring Fred Rogers from the PBS children's television series "Mister Rogers' Neighborhood" with his King Friday XIII puppet. The U.S. Postal Service plans to issue a new stamp on March 23, 2018, in the same Pittsburgh public television station where the program was produced. Rogers died in 2003 at 74 after battling stomach cancer. It's been 50 years since Fred Rogers first appeared on TV screens, a gentle and avuncular man who warbled "Won't You Be My Neighbor?" as he changed into a cardigan and sneakers. "Sometimes I think I wish we had a bat signal for Mister Rogers right now," said comedian Sarah Silverman, who has hung a portrait of Rogers on the set of her Hulu series "I Love You, America" for inspiration. The golden anniversary of America's favorite neighbor's appearance is being celebrated with a PBS special next month, a new postage stamp, a feature-length documentary coming out this summer and plans for a Tom Hanks-led biopic. "It's just a wonderful, thrilling time for me," said his widow, Joanne Rogers. "I'm just sorry that Fred's not here to share it. But I think he would be just as amazed as I am." It offered a soft haven for kids, in sharp contrast to the louder, more animated competition. The final episode of what his widow calls "a comfortable lap" aired August 2001. Rogers died in 2003. "No one has come along like him. Everything is based on high stimulation. He really was exactly the opposite," said actor John Lithgow. "He had such a sense of children's' developmental needs. And I think that's under assault these days." Lithgow, whose kids were enchanted by Rogers growing up, is joining Silverman and celebrities like Whoopi Goldberg, Yo-Yo Ma, Esperanza Spalding, Judd Apatow and hosted by Michael Keaton for the public television pledge special "It's You I Like" set for March 6. "I've thought about him more and more over the years because there's no one like him," said Lithgow, who met Rogers while touring with his own concert series. "There is no one who so completely talked on the level of children — not talking down to them, not talking up to them — just talking right to them." One of those kids was Angela Santomero, who would go on to focus on child development and create "Daniel Tiger's Neighborhood" and co-create "Blue's Clues." If Rogers' baton has been picked up by anyone, it's Santomero. "I was his No. 1 fan. Like I literally could not sit any closer to the TV set when he was on," she says, laughing. "When someone looks you in the eye — I don't care if it's through the TV screen — and tells you that 'I like you just the way you are,' it's very powerful." Homage to Rogers is baked into "Daniel Tiger's Neighborhood," which features children of characters from "Mister Rogers' Neighborhood," including Prince Wednesday, the child of King Friday XIII, and Katerina Kittycat, the daughter of Henrietta Pussycat. Rogers' effect on popular culture was profound: Eddie Murphy parodied him on "Saturday Night Live" in the 1980s and one of Rogers' trademark zip-up sweaters hangs in the Smithsonian's National Museum of American History. He's had a category dedicated to him on "Jeopardy." PBS stations around the country still air "Mister Rogers' Neighborhood" and some can be found on the PBS Kids video app. There are DVD collections on Amazon and episodes are streamable on Amazon Prime. Rogers has remained relevant in this high-tech and ironic age despite a lack of new episodes. Generations of kids — and those who became parents themselves — have found in Rogers' heartfelt, simple lessons a comfort blanket in times of stress. At a time when media icons have been tarnished or pulled down, Rogers endures. "He's essential right now. His teachings and his beauty and love and patience and care and empathy and compassion are our only salvation right now," said Silverman. Last year, amid proposed slashes to PBS funding, Rogers' 1969 Senate testimony defending public TV from budget cuts went viral. And when a shaken Jimmy Kimmel addressed his viewers following the Las Vegas mass shooting, he quoted Rogers' dictum to "look for the helpers." "I can't think of a time when we've needed him so much," says Joanne Rogers, 89, an accomplished pianist who still lives in Pittsburgh. "I think his work is just as timely now as it was when it came out, frankly." The celebration of Rogers also includes a new feature-length Rogers' documentary called "Won't You Be My Neighbor?" to be released by Focus Features on June 8. It includes behind-the-scenes footage of the TV show and never-before-seen clips. And the U.S. 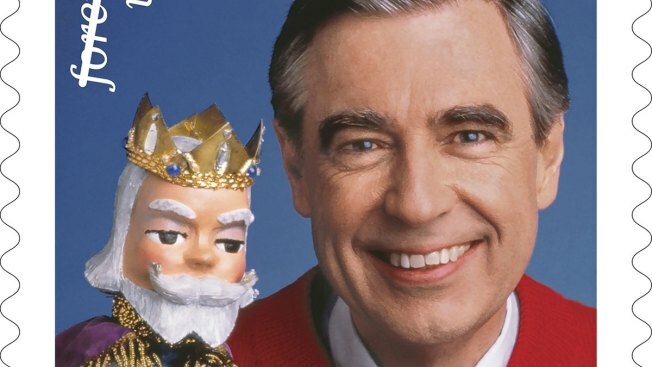 Postal Service will unveil a new stamp featuring Rogers on March 23 in the same Pittsburgh TV station where "Mister Rogers' Neighborhood" was produced. The Forever stamp features an image of Rogers and the royal puppet King Friday XIII. Bill Gicker, creative director of stamp development, said the decision to honor Rogers was a "no brainer." Gicker was born the year the show went national and grew up watching "Mister Rogers' Neighborhood." "There are certain people that come up that you just know it's not going to be a conversation. It's just going to be, 'Yep!'" said Gicker. "His calm demeanor really made him stand out, especially at a time when a lot of television wasn't for kids at all." The 50th anniversary celebrations are somewhat bittersweet for Joanne Rogers. While fans cheer Rogers' pacifism and kindness, she joins them, of course, but she also misses her husband. "I don't know how he would have liked growing older," she said. "I think he would have just tackled it the way he tackled everything else. But he wasn't given that opportunity and I regret that."